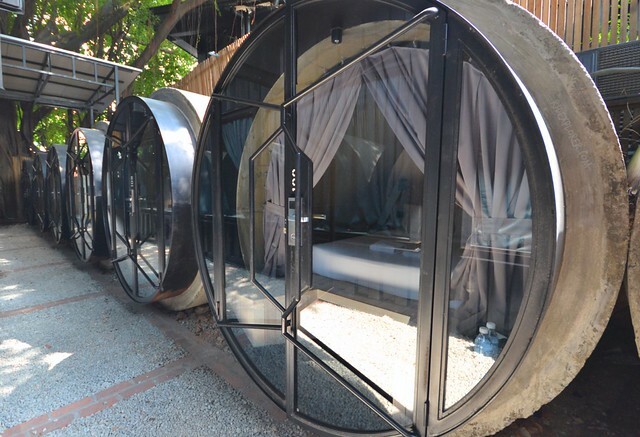 Container concept is currently creating a buzz when it comes to hotel accommodation. 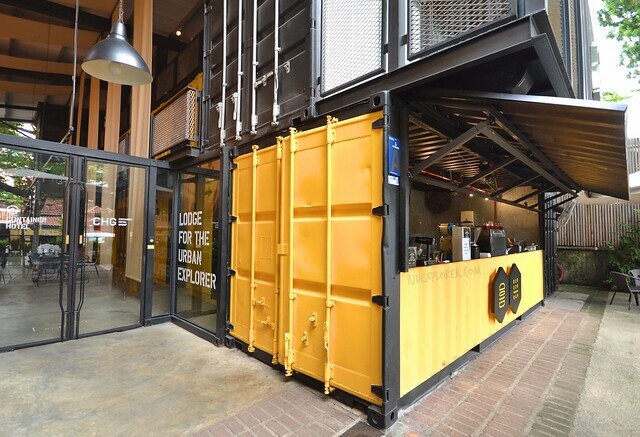 Container Hotel Group is one of the first brands to offer such experience in Malaysia. My first encounter with a container-type accommodation was my stay at Capsule by Container Hotel at KLIA2. Apart from the airport location, the brand actually has several properties in Malaysia: in Kuala Lumpur, Penang, and Ipoh. 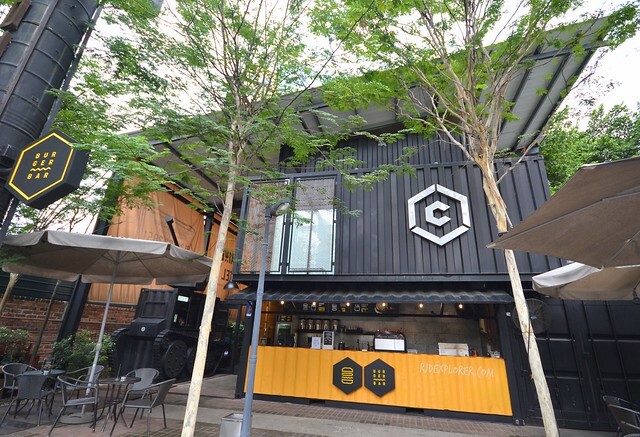 Container Hotel Kuala Lumpur, one of the properties of Container Hotel Group. ‘I hope they won’t put you inside a container,’ a Malaysian guy I met in Tanjung Gemok. He asked where I would stay in Kuala Lumpur and that was his answer when I told him Container Hotel. I clarified that it’s the concept and guests will literally stay in container vans. He chuckled and told that it was his first time to hear about it. 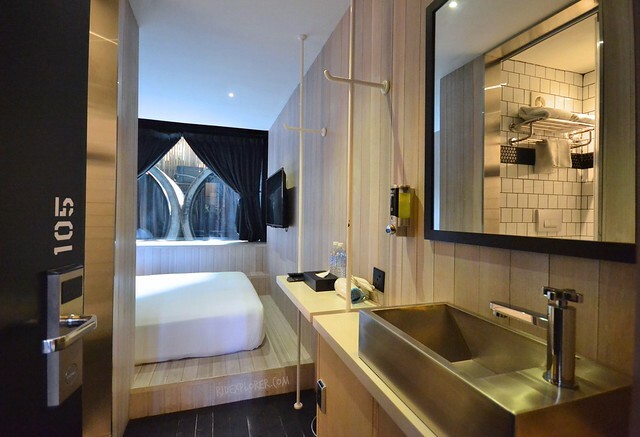 Container Hotel Kuala Lumpur is in Bukit Bintang area but on the quieter side, away from food streets and shopping centers. Nonetheless, these spots are just 10-15 minutes by foot or a 3-minute drive from the hotel. The area also has a handful of seafood, Chinese, and Malaysian restaurants. Dining is not a problem if you just want to have a relaxing staycation over the weekend. Another room type is the concrete rooms that are detached from the main building. We arrived in TBS around 10:45 PM just in time for the last train to Hang Tuah. Thanks for a free Wifi near the station, I was able to book a Grab car that brought me in front of the hotel. At 11:30 PM, the hotel’s front office surprised me and reset the tiring day I had. 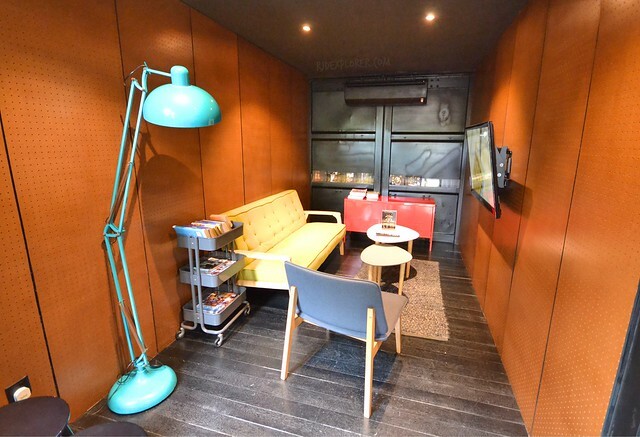 Container Hotel’s front office is a battle tank! Deluxe room perfect for couples and friends who yearn for privacy. My booking reservation was immediately verified on their system and I got in my room in no time. Container Hotel has several room options, actually. They have four room types: deluxe and suite rooms on the container side with en-suite bathrooms, and concrete room and camp site with shared bathrooms. I decided to experience the camp site because it’s a different offering from the usual container vans. The other option, concrete room, was also interesting! The space that the rooms provide can actually sleep up to two persons. Apart from the en-suite bathroom, other amenities differ between rooms. Freebies on all rooms include a bottled water, complimentary Wifi, and in-room slippers. Camp Site for free-spirited travelers who love staying in private indoor cabana tent. Camping ground is on the topmost floor. If I remember it right, they have four rooms for that kind. The entire room is very visible from the outside with the floor-to-ceiling glass. It wouldn’t be a camping if there’s no tent. Privacy of guests is provided by the tent housing two twin-sized beds. The beds are placed over wooden crates and secured with clean beddings, pillows, and blankets. There are also camping desk and chairs. Shared toilet and shower for camping site guests. 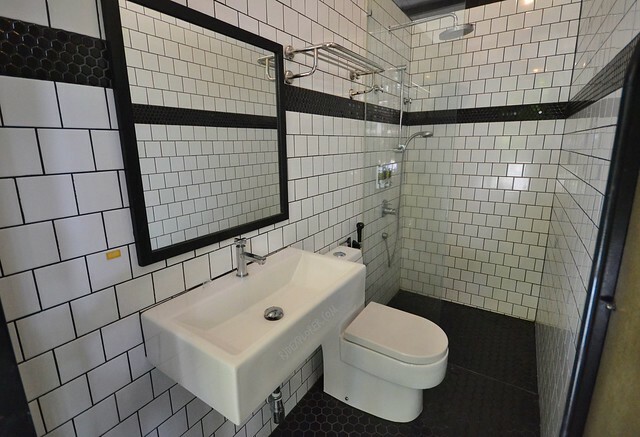 Toilet and shower are located on the same level equipped with overhead and handheld shower. Shampoo and body wash are available in wall-mounted dispensers. Only two cubicles are available on the floor but more shower areas are on the ground floor of the hotel. Lobby lounge on the ground level. For rooms having no entertainment systems, the hotel’s lobby lounge on the ground level has a cable-ready television. I found the spacious desk in the room as my working desk during my stay at the hotel. 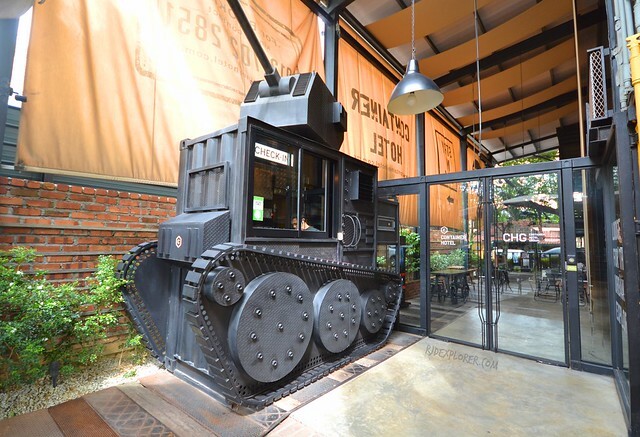 Container Hotel has its own restaurant, still in a container, just a stone’s throw away from the battle tank office. Burger Bar is in-charged of serving affordable and tasty burgers for their guests. 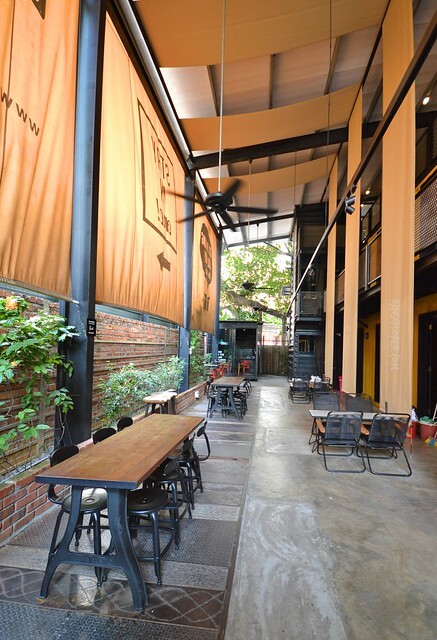 You can also have iced-cold drinks and freshly fried fries on their open-roof concept of dining. 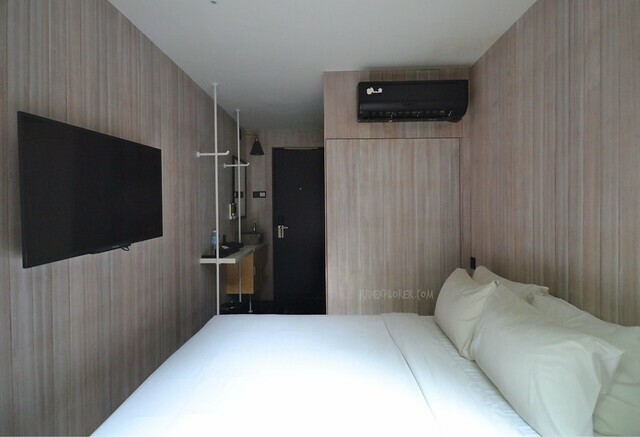 I’ve had several camping trips before from mountain, beach, and islands, but the city camping experience in Container Hotel is a different one. I just wish that they set-up the ceiling of the rooms fully open to complete the urban camping experience. 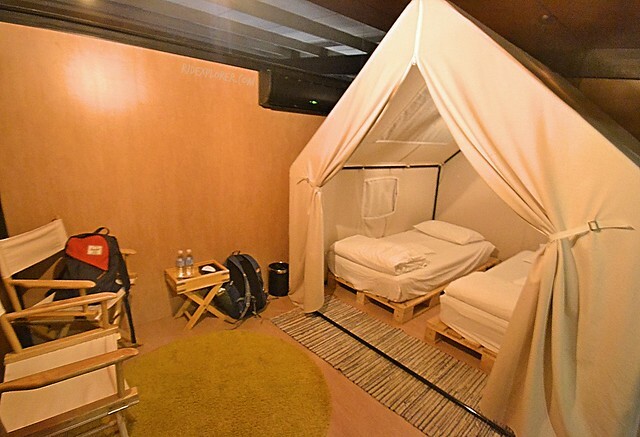 Nonetheless, it’s a cool place for free-spirited travelers eager to experience a glamorous camping when in Kuala Lumpur.